2018 is quite a year for our society as it is our 85th year of bringing the night sky to the public. It is our LAS Legacy year. In 2017, we, as a team with over 200 members, broke all records for public outreach as we had close to 20,000 people attend our events. We extended far beyond Greater Louisville as we traveled together to Western Kentucky where we shared the Solar Eclipse with Boy Scouts, Girl Scouts, students, members and visitors. While last year was a great year for public outreach, we are going to change around a bit and proclaim 2018 as a year of LAS InReach in which we educate our members, old and new, about the LAS and what it has to offer. So far, we have had several public outreach events as diverse as Scout University, the Parklands of Floyds Fork Membership meeting and setting up scopes on top of a New Albany restaurant to celebrate the Blue Moon. Now, InReach begins. We are proud to sponsor an amazing all ages space conference, where you will hear from NASA engineers, astrophysicists and space policy experts about how they need you to help shape the future of space exploration! Come early and join us, as we provide views of the sun with our solar telescopes, This is also a time to enjoy other sponsor booths, which will provide VR experiences and workshops. Becky will welcome us with a conference introduction and a presentation on what's going on in space today. Tracy will talk about her work as Flight Systems Engineer at NASA JPL, share details of the Kepler Mission's discovery of exoplanets, and share the inspiring story of her career path, from Louisville to NASA JPL. Stephen will share details of the amazing work done at NASA JPL through his work on the Juno Mission to Jupiter and the Deep Space Network. He will unveil the vast opportunities available to those interested in working with NASA JPL. Intermission - enjoy the sponsor booths, workshops, networking, food trucks, drinks and entertainment. Casey will share his wealth of knowledge regarding the inner-workings of space policy, how NASA’s budget is determined, and how every citizen can help shape the future of NASA and space exploration. Breanna will dazzle the audience with an astrophysicist’s unique view of our Universe, and talk about the programs available at the University of Louisville. Entertainment, mingling, networking and sponsor booth workshops. The Milky Way is an Hour Away - Come to Curby! Since 2000, the LAS has owned a forty acre dark site in southern Indiana less than one hour away from downtown Louisville. Its official name is the James G. Baker Center for Astronomy. But all of us in the Louisville Astronomical Society just call it Curby after the small town in southern Indiana that is just a few miles away. What is a dark sky site? As the name implies, it is a place of wonder where you can look up and see the Milky Way horizon to horizon and galaxies naked eye. Curby has an light controlled observing field between a well-equipped MPB we call T-2 and a roll-off roof observatory where three mighty telescopes wait to open up the night sky for observations of the moon, planets, galaxies and deep sky objects. These instruments, a 16” Meade SCT, a 150mm Astrophyics Starfire Refractor and a Celestron C-14 are ready for you to stargaze through in style. In fact, our building size and its instruments make it the largest observatory in the region. LAS members come together here monthly on Member Night to talk astronomy, observe and enjoy their passion together. We also offer Public Programs and scout astronomy merit badge programs to promote astronomy which is our club’s mission. When you need a break, our climate-controlled multi-purpose building is just steps away. T-2 is at the front of the field and features his and her restrooms, a kitchen and a classroom equipped with computers and programs to help you plan your viewing. Be prepared to see the night sky as you cannot see it from Louisville. Come to Curby for member night or public night! It is included in your membership and is a great asset for all. For directions, go to the observing venues section of this website. Enjoy! The April meeting of the Louisville Astronomical Society will be held on Saturday, April 15 at 7:00 PM in the Cochran Auditorium of Strickler Hall on the U of L campus behind the Planetarium. It will feature JPL Systems Engineer Tracy Drain. She will be speaking about the Kepler mission although Tracy has served on the MRO and Juno mission teams. Tracy will be giving a STEM-oriented talk for young adults and students in the same lecture hall at 3:30 PM. While she is in Louisville, she will be visiting schools as a role model. Image above: JPL mechanical engineer Tracy Drain stands outside JPL. 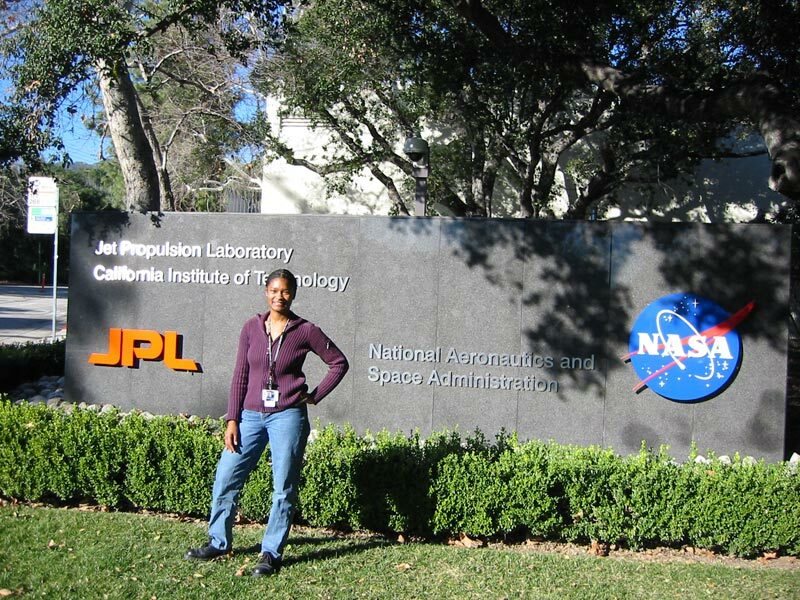 Tracy is a Flight Systems Engineer at the Jet Propulsion Laboratory in Pasadena, CA. Tracy was born and raised in Louisville, Kentucky, where she graduated from Waggener High School in 1993. She received a BS in Mechanical Engineering from the University of Kentucky. While at UK, she interned at the NASA Langley Research Center in Hampton, Virginia. She went on to receive her MS in Mechanical Engineering from the Georgia Institute of Technology in May of 2000. In her 15 years at JPL, she has participated in the development and operation of the Mars Reconnaissance Orbiter(MRO), Kepler (searching for new Exoplanets) and Juno, orbiting Jupiter to find new knowledge about the Gas Giant. MRO is still orbiting Mars and returning valuable science data about the red planet. It also serves as a communications relay for the rovers currently exploring Mars. Tracy left MRO in the fall of 2007 to join the Kepler project, which was preparing for a March 2009 launch and a mission of hunting for Earth-like planets orbiting other stars in our Milky Way galaxy. In May 2009, Tracy joined the Juno project on the Project Systems and Flight Systems Engineering teams. Juno is studying the giant planet's gravity and magnetic fields and learning about its structure. That knowledge will help scientists learn more details about the early history of our solar system. Tracy became interested in space as a child, and her love of Math, Physics and anything related to Space led her to pursue a career as an engineer at NASA. In her free time, she can most often be found curled up with a good book (her other favorite way to explore new worlds). While in Louisville, Tracy will be visiting schools as a role model and she will give an extra lecture for kids prior to her 7:00 lecture. To say that 2016 was a banner year for the LAS would be an understatement. Let’s review. Due to our improved website, in 2016, we came from 80 members to 150 members. We have over 1,000 in our Facebook group. Our core group has expanded. Our dedicated sidewalk astronomers have brought solar, lunar, planetary and deep sky observation to over 20,000 guests at locations as diverse as the stars themselves with over 14,000 viewing the stars with the B4B volunteers. We finished 2016 the year with just under $10,000. in the bank which is a great head start on our projected budget of $6,000. in 2017. $3,500 of our treasury came from new membership, another record. With 2016 being a record-setting year, where do we go from here? Upwards, of course! With a grant from the Louisville Metro Council, we will have $10,000 worth of new telescopes and accessories..
We will be heavily involved in educating students about the Great Solar Eclipse of 2017. Our scouting activities will increase as we have joined the Girl Scouts of Kentuckiana Space Team with four events already scheduled. And, of course, we will break records with our LAS sidewalk astronomy efforts. We are also putting together another great Summer of Science that may top 2016. So, what can you do to help make 2017 greater than 2016? Get involved! Be a part of the LAS outreach team! Watch the website for announcements and join us at our events. Don’t be left behind as we travel - To Infinity and Beyond! Woohoo -Intro to Astronomy Training Starts Now! Seating is Limited to First Come-First Served! The Louisville Astronomical Society is excited to announce our first classes that will be coordinated using the new website tools. Our first two classes are for Members only. They are Intro to Astronomy One and Two and are Free for all members. Classes are geared to the person that is new to astronomy. If you are interested, log in to your account and click on the Events tab. Scroll down to Sept 22 and 29. Online registration is required and seating is limited to First come-First serve. Well, it took us a few months but we have the first listings for member training on your LAS website. The first training listed will be for orientation at the James G. Baker Center for Astronomy at Curby. Before you can sign up to use the observatory on your own, you will need to take this training. Enjoy and be sure to tell Ron Yates thanks for offering this orientation training. And...if you have an interest in other training/guidance we might offer, just drop us an email on the Contact page. As July explodes in our face, blotting out the night sky with fireworks, we have some internal fireworks happening in the Louisville Astronomical Society. The rocket goes up and BOOM, we just passed the century mark once again on membership. These new members are receiving notifications of when and where events are happening and are getting a welcome letter from the LAS. We are heading toward a goal of 200. At that point, we will generate $6,000. annually and will not have to be dependent on areas like scouting and equipment sales to sustain us which will let us concentrate our efforts on other areas vital to our growth. A second mortar rises into the sky and BOOM, we have new members Charley and Mary Alice Keeton informing us that their son Chuck Keeton from the Rutgers University Physics and Astronomy Department will be in town in early July. We will have a lecture by Chuck on Sunday, July 3 at 4:00 PM at our LAS Urban Astronomy Center on Dark Matter and Gravitational Lensing. Imagine! A world-class researcher at our LAS facility! With a double BOOM, old members Bob and Pam Hart also informed us that Pam's nephew Steve Watson, a JPL software engineer on the NASA Juno mission to Jupiter would be in town in early August. He will be doing a talk at both the UAC and Curby August 5 and 6. Prior to his talk, we will have extensive publicity on WDRB's Morning Show and a full page article in the Corydon Democrat and the Clarion in Crawford County, IN plus a press release to all radio and TV stations. BOOM! BOOM! BOOM! The LAS is exploding with excitement. Wes and Lori Newton, lifetime members, just donated a brand-new GE SXS Refigerator for the UAC. We have reversed the UAC and the old board room is now the storage room for equipment. The old equipment area is now the boardroom. Curby is in great shape thanks to Ronnie Yates and his crew. Group events are increasing under Frank Nelson's leadership and the B4B guys are pushing the LAS, sometimes nightly. Personally, I have been making efforts to increase scouting events aided by Larry and Sue Loucka and Becky Steele. I have contacted the Hoosier Trails district in Bloomington, IN and the Crossroads of America district in Indianapolis so that they can send email blasts out about our STEM efforts. Many of our past scout groups have come from as far away as Chicago, so it made sense to go north. Becky and Sue are working on Girl Scout groups and American Heritage scouts. I have also been visiting schools and Atria centers this summer to spread the word about the LAS and I am currently working with several Metro Council members to receive funding from them. Who knows when the fireworks show will end? I hope never. With the team we have now, launching from a firm platform built by past members and boards, people will always be looking up to a new, exploding Louisville Astronomical Society. Today, June 30, we have reached 100 active members. That is 20 new members since May 1 of this year and we are looking forward to meeting all of you at our astronomical events. Please let us know if there is any assistance you may need with your telescopes or ideas on helpful programs we should consider adding. Again...a big welcome to our new members! New members: You may send your feedback using the Contact page form. And not to forget our existing member volunteers who put in many hours (and often late hours, of course) to provide the Louisville area with interesting and fun night sky viewing. Thank you!